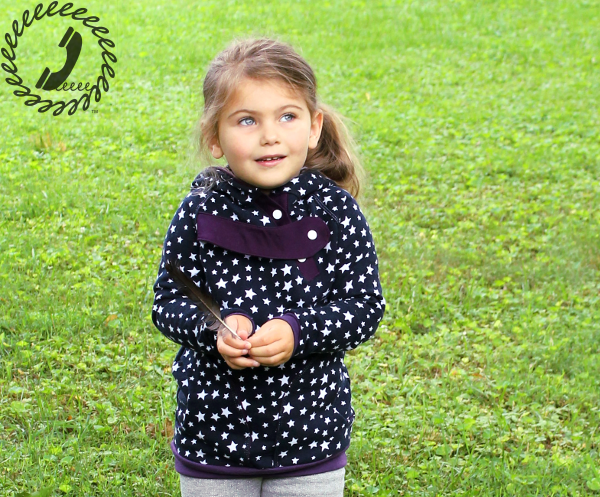 It’s time for another round of Sewing with Boys – Girl Edition. 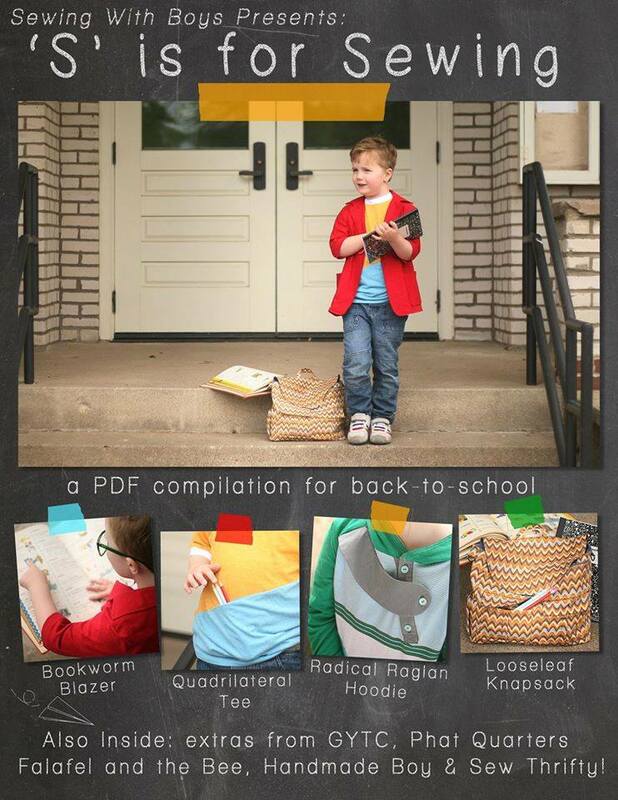 The lovely ladies at Sewing with Boys have created another amazing e-Book, this time with a back to school theme. You may wonder why I keep joining these boy sewing tours, but the answer is simple: they take “boy” styles and jazz them up with ALL THE DETAILS. For girls you can make an a-line skirt special by adding ruffles or bows, but for boys you need to have a little more imagination. And this ‘S’ is for Sewing e-book is full of a ton of special little details any boy or girl would love. 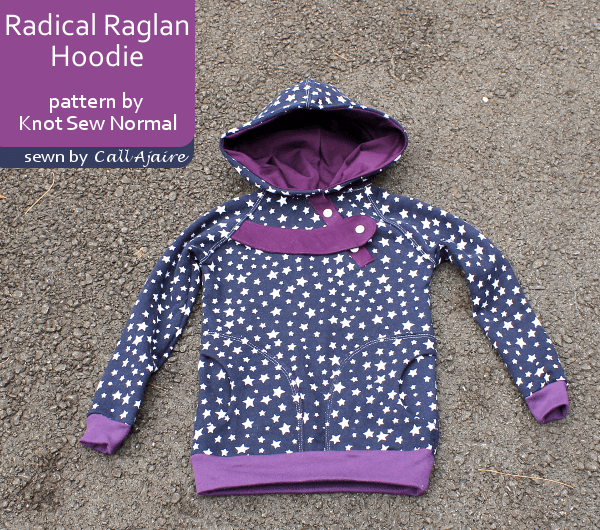 I chose to sew the Radical Raglan Hoodie from Knot Sew Normal. Right away you can see some fun details, right? That cross over closure is a great design feature and perfect for a woven accent fabric you’ve been saving up. The pattern is meant for knit fabrics with ribbing at the sleeve cuffs and hemline and woven placket/accents, which means there’s lots of room for personalizing your hoodie. Of course for Bean, personalizing means purple. And more purple. 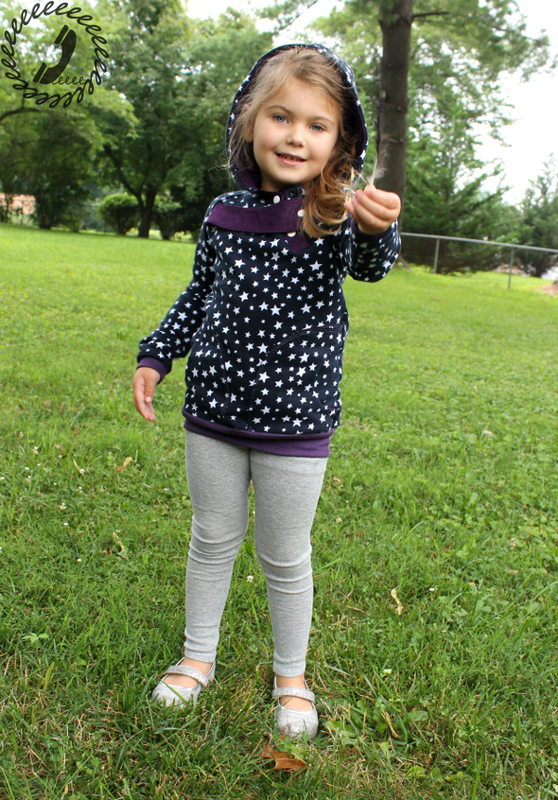 I finally settled on this star sweatshirt knit that I planned to use last summer and never did. It has more stretch than some sweatshirt knits so it worked great for this pattern. I like that the arms have a slim look to them without being too snug. 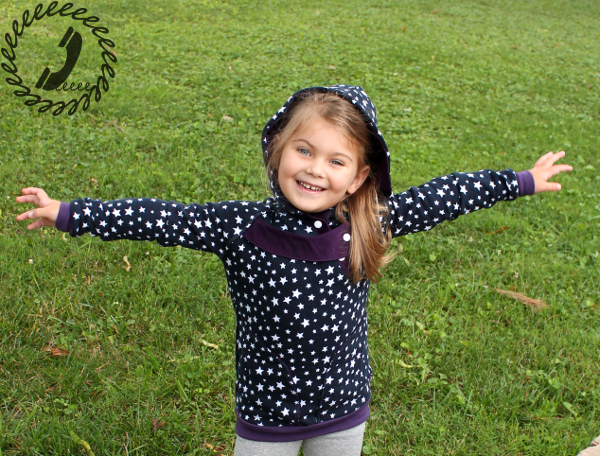 This is the size 4t with no alterations and it’s a great fit. 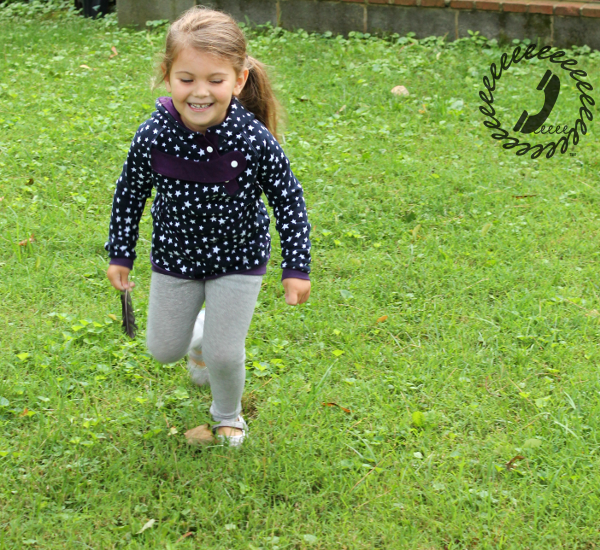 Bean was so excited to find a feather in the backyard this morning so we had to get lots of pics showing the feather, hehe. The pockets are another place you could add some fun fabric, but I stuck with the star knit with the purple woven for the lining to keep it toned down. 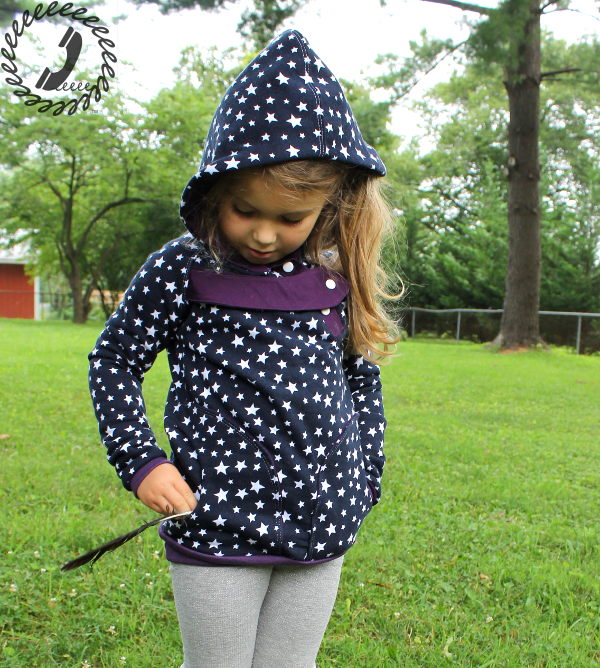 The star fabric is so busy on its own that I didn’t want to add too much to this hoodie. I did topstitch the pocket curves (and most of the other seams as well) in place using the Janome CoverPro 1000CPX which I think makes it look so professional. 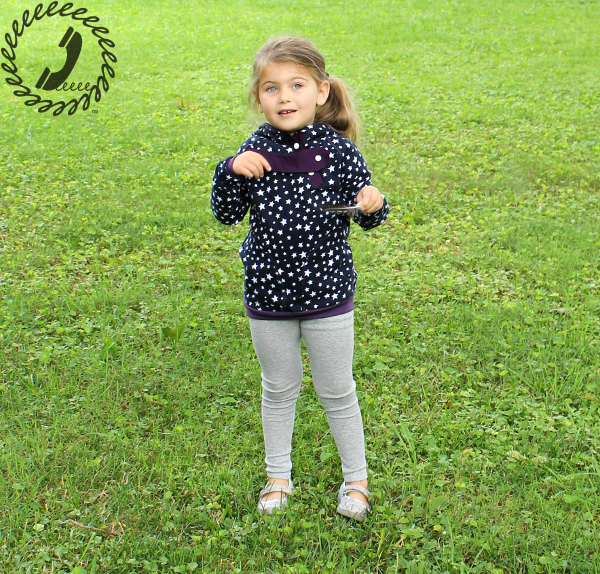 She LOVES her new hoodie which will be great for cool autumn days so I’m happy to check yet another item off the school clothes list! So run quick to get your own S is for Sewing e-Book and get started sewing some super fun pieces for the detail lover in your life! And check out the rest of the tour and get a look at some of the other cool patterns in the e-book on the Sewing with Boys site.